What is bouldering? Is it different to climbing? Bouldering is a form of rock climbing which takes place on boulders and other small rock formations or indoor walls that on average are 4m high. Unlike top rope climbing and lead climbing, no ropes are used to protect or aid the climber. Instead the floors are covered with matting a foot deep. Do I need to bring my own shoes and chalk-bag? No, you can hire them on site for a small fee. If you have booked a lesson, shoes and chalk hire are included in the price. I’ve never climbed before, how do I start? As a new climber you NEED to book yourself an introduction lesson. These comprise an hour with an instructor to show you around the centre and lessons to teach you how to stay safe and introduce you to climbing techniques. No equipment is necessary, just bring yourself. If you are coming with a competent climber they can fill out a supervision form which will allow you to climb under their care. I’ve climbed before, but could do with a refresher – can you help? Yes. 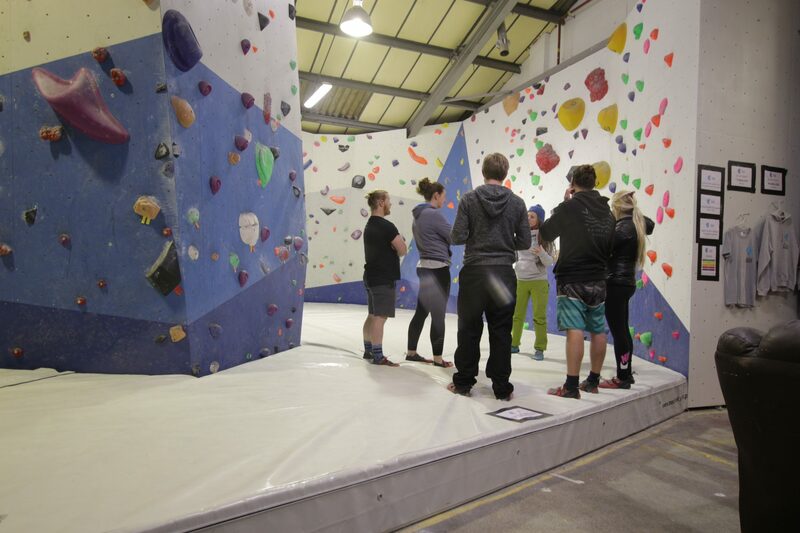 We have a wide range of lessons available for climbers of all experience. I’m an experienced climber, can I just come and climb? Yes. After registering, there is a range of access from single-entry to annual memberships. Can I drop my kids off and collect them later? If your children are under the age of 14, they will have to be supervised whilst climbing. This can be done by booking them onto one of our sessions with an instructor. Or they can be overseen by a registered member with a ration of 1:2 above the age of 6 and 1:1 when 5 or 6. Between the ages of 14 and 18 they may climb unsupervised once they have passed our introduction and a legal guardian has signed a consent form. I’m coming for a climb before work / school / a date…do you have showers? Yes, we have fully equipped showers and changing facilities. Can I park at the centre? Yes. But we have limited spaces. There is off-site parking available but please refer to the local council website for parking times. Alternately our closest bus stop is only 0.1 miles away and is serviced by buses 62, 62A, 62B, 72, 75, 78, 102, 103, 104, 105, 107 and the X15. If you cycle we have secure covered cycle parking. I’m an experienced climber, can I teach my friends who are beginners? On your first visit to Colchester Climbing Project, you will be asked to fill in a Supervisor Assessment which will be checked by a member of our team. On successful completion, you’ll be able to supervise a maximum of 2 people (1 if under 6 years of age). Do I need to book or can I just come in? You do not have to make any booking if you do not require a lesson. However, we strongly suggest filling out our pre-registration form before arriving so that you can get climbing as quickly as possible. If you are looking for our T&Cs please click here.